Have you ever repeated a phone number over and over in your mind in order to remember it, yet forgot it anyway while dialing? This common occurrence reflects a failure of working memory, a type of memory that can be thought of as a “mental workspace” or a temporary “sticky note” for information important for the task at hand. Working memory is limited in capacity (5 +/- 2 items) and helps us remember things over brief periods, which is in contrast to the nearly limitless capacity of long-term memory. A well-accepted theory of working memory suggests that it is comprised of multiple components: a verbal component, a visual component, and an attentional control. When information enters working memory, it tends to reside for approximately 30 seconds or less before being moved to long-term memory or being forgotten if it is no longer required for the task at hand. Although forgetting a phone number is a rather benign example of a failure in working memory, failures in this critical ability could be highly detrimental, for example, to a child in school trying to actively follow instructions and learn new material. Early childhood presents an interesting time to study working memory as it shows rapid development in young children. Aspects of this development coincide with children’s entry into formal schooling (around 5 years of age) where demands on their working memory ability occur with regularity. Working memory is important to gain reading and mathematical skills, and some research even suggests that it may be a better predictor of academic achievement than measures of general intelligence. Given the important role working memory serves in supporting learning, deficits in this ability can contribute to learning disabilities, which impact one in five children in the United States. Although much is known of the behavioral development of working memory, it is important that researchers also have an understanding of how the brain supports this ability during such a critical period in development. Studies have shown that the amount of gray matter in the cortex (brain cells and their connections to each other) relates to the development of behavioral abilities, including working memory, in older children. 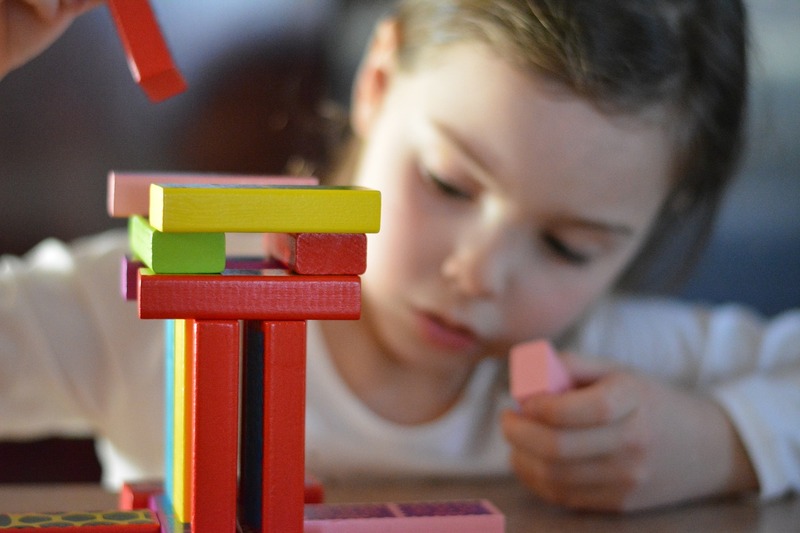 During early childhood, the brain undergoes vast changes, including the pruning or removal of unnecessary connections and the strengthening of important connections, which impacts the amount of gray matter in the brain. As a result of these neurodevelopmental events, the amount of gray matter changes dramatically in early childhood. Specifically, volume in some parts of the brain, including regions in the frontal cortex, is reduced. Because gray matter declines at certain points in development, a mature cortex, although counterintuitive, is typically characterized by less gray matter with more efficient connections. Although some studies have suggested associations between the development of the cortex and working memory in older children (i.e., > 8 years), few studies have focused on early childhood (i.e., < 8 years), a critical time for learning and acquiring new skills. To investigate how the structure of the brain relates to working memory in young children, we asked children ages 4 -8 years old to complete a working memory task, referred to as digit span, and a structural magnetic resonance imaging (MRI) scan. During the working memory task, an experimenter read sequences of digits to children and asked them to repeat the digits in the same order (for example: “5, 6, 2”). The sequences increased in length as the task progressed until the child was unable to correctly repeat the digit sequence. This task taps a specific verbal subcomponent of working memory. We also assessed IQ via verbal and block design measures on age-appropriate standardized general intelligence tests (i.e., Wechsler Preschool and Primary Scale of Intelligence and Wechsler Intelligence Scale for Children). Using structural MRI scans, we examined associations between children’s performance on the working memory task and the amount of gray matter in specific areas of the cortex that have been identified as important for working memory (referred to as the frontoparietal attention network) in adults and older children as well as in the whole brain. Our study showed that older children performed better on the working memory task than younger children. In addition, the amount of gray matter in the cortex in various regions in the frontoparietal network was negatively related to performance on the working memory task. Specifically, children with less gray matter in the specified regions performed better on the task than children with more gray matter. These results were specific to working memory and did not relate to IQ. One specific region, anterior cingulate cortex, was especially relevant for this task. In particular, results showed that age impacted the structure of the region, which in turn, impacted memory. In other words, older children had a thinner anterior cingulate cortex, which in turn, related to a better working memory score. These findings were replicated when we examined the whole brain. In addition, a few additional regions were also identified when examining the whole brain, suggesting that young children may rely on a wider set of brain regions to complete working memory tasks. This is consistent with theories of brain development but awaits replication in future studies. Overall, this study supports the notion that working memory develops quickly in early childhood and that specific areas within the frontoparietal network of the brain are important to its development. Furthermore, it suggests that the amount of gray matter in the cortex, which is altered throughout development, relates to children’s working memory ability. Given the complex relations between brain and behavior and the high occurrence of working memory deficits in children, a deeper understanding of cortical changes implicated in working memory is vital as it can potentially inform interventions for children who exhibit or are at-risk for working memory impairments. These findings are described in the article entitled When less is more: Thinner fronto-parietal cortices are associated with better forward digit span performance during early childhood, recently published in the journal Neuropsychologia. Morgan Botdorf is a doctoral student in the Cognitive and Neural Systems program of Psychology at the University of Maryland, College Park and NSF Fellow. She also received her Master of Science degree in Psychology from the University of Maryland. Morgan’s research interests include brain and cognitive development in early childhood. Specifically, she is interested in how structural and functional changes in the brain relate to the development of memory in young children. She is also interested in how factors, such as early life stress and parenting, influence brain and cognitive development. Tracy Riggins received her Ph.D. in Child Psychology from the Institute of Child Development at the University of Minnesota in 2005. She completed postdoctoral fellowships in pediatric neuroimaging at the University of California, Davis and the University of Maryland, School of Medicine in Baltimore. The goal of her research program is to provide a better understanding of memory development by examining changes in neural substrates supporting this ability. The empirical research conducted in her laboratory involves both typically developing children and children at-risk for cognitive impairments and uses a combination of behavioral, electrophysiological, and neuroimaging methodologies. Findings from her research have revealed that early childhood is a time of rapid change in children’s ability to remember life events. Dr. Riggins was recently awarded a 5-year grant from NIH to examine the neural mechanisms underlying these changes in memory in children aged 4 to 8 years.